Solar Art installed a brushed aluminum vinyl building wrap in San Diego, California. The customer’s goal for this installation was to match the aluminum slate facade being installed on the lower half of the building. They wanted a window film that would not only match the lower half of the building, but also significantly reduce heat from the afternoon sun and keep a uniform look throughout the building. They worked with our sales team and decided to have Avery brushed aluminum vinyl in a custom stripe pattern wrapped across the upper half of the building. 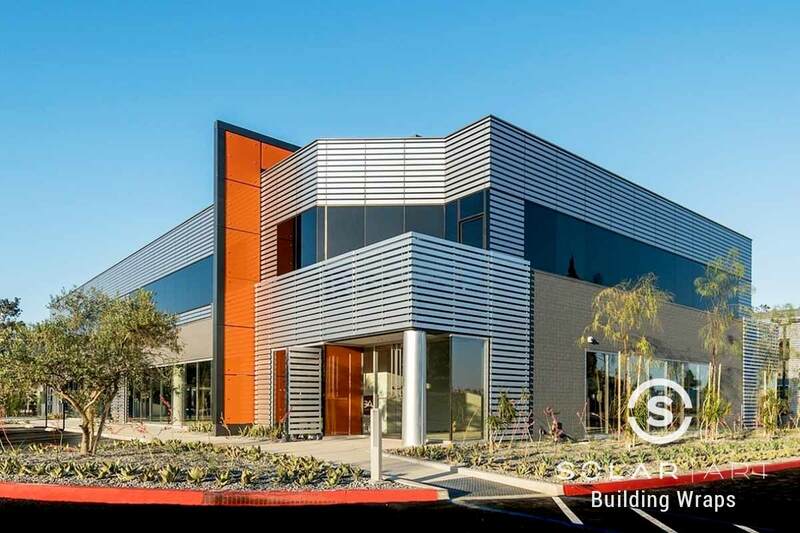 The Avery brushed aluminum vinyl matches the slate facade on the lower half of the building and the cut striped pattern created an awesome design look. It was a win-win situation. The upper portion of the building matched the lower portion of the building and it added a really cool design factor. Building wraps are a cost effective and simple way to completely update your building. This building is now the best looking building on the block, which could draw in potential customers. Not only could it draw in potential customers, if you are renting out the building, it is much more appealing to potential tenants. Building wraps can be removed with no damage to the glass if need be. In addition to building wraps, Solar Art also services solar film, anti graffiti film, security window film, and custom graphics to residential and commercial settings. Speak with Solar Art today to see if building wraps are for you! Interested in Brushed Aluminum Vinyl Building Wraps ? Contact us directly to talk about building wraps! Brushed aluminum vinyl building wraps greatly reduce heat, reduce glare and block 99% of UVA and UVB rays. They are an affordable way to completely transform a building. Contact Solar Art to learn more!